Being the most popular video sharing website on the internet, YouTube has a whopping 1 Billion active users every month. Now that we’ve dropped that bombshell, it’s probably not surprising to hear YouTube is one of the best places to advertise. Whether you have a commercial or a static ad, YouTube offers ad space that can hit hundreds of millions of impressions every day. Say you’ve tuned in to watch this guy get shocked by his microphone on stage. But when you click the thumbnail, you’re greeted with a deodorant ad. What? I don’t want to see this! And the second you see the “Skip Ad” button, you reach for the mouse. Man, those five seconds were unbearable! Most of us know that the majority of viewers are fickle and impatient. But ads don’t have to be an annoyance. There are ways to get people to want to view your ads. The following tips and tricks will make your ad worth watching, and worth clicking. These ads are typically static ads that link to the advertiser’s website. Around the beginning of the video, the overlay ad often appears at the bottom of the YouTube player, while the display ads tend to appear next to the YouTube player. The viewer has the option to immediately exit out of overlay ads, so it’s important that you make an impact. Include an enticing offer and a pleasing design. Consider narrowing your search and place your overlay ad in videos that are of a related topic to your business. This way, you’re more likely to get clicks. Display ads eliminate the possibility of viewers closing your ad. But you still need to make it interesting enough to click. Since YouTube display ads are typically square, as opposed to the narrow rectangular overlay ad, you have a little more creative freedom. If you’re creating an in-stream ad, you’ve got your work cut out for you. A lot of YouTube viewers left their TVs behind to avoid ads just like yours! So when writing your ad, you have to create something that viewers want to see. 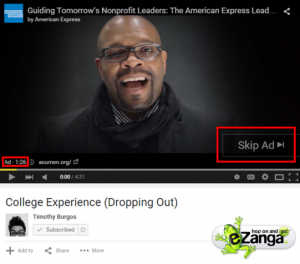 If your ad comes with the, “Skip Ad,” button, you have five seconds to grab the viewer’s attention before they move on. How am I supposed to captivate an audience in five seconds? There are several approaches to pulling your audience in. You could scare them, make them laugh, pose an intriguing question, or open with a visually stunning shot. Whatever you do, make sure you do it fast. There are too many ads out there that open up slow. Though their ad may have been good, the first five seconds were not. And so the majority of viewers didn’t stick around for the rest. But you can’t put your all into the first five seconds. You’ve raised your viewers’ expectations. Now you have to live up to them. Keep them scared, keep them laughing, keep them guessing! Engage your audience. Make them want to keep watching. That’s how you get clicks. This ad is fairly simplistic, but the clean, vocally-driven music is very pleasing to the ear. It catches the viewer’s attention almost immediately. Oh, that sounds nice, what’s this? In fact, the only audio used in this ad is the music. This prompts the viewer to read the text on the screen. If your viewer has to read during your ad, they become more engaged with the information you’re presenting, increasing the likelihood that your message will stick. When making your ad, try to tell a story. It doesn’t have to be deep or complicated, just compelling enough to keep the viewers watching. Consider making it interactive. Let your viewers decide the outcome of the story by linking to two separate endings. 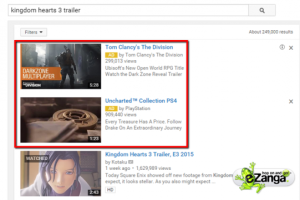 Since in-search ads don’t appear in the video player, they’re less invasive. However, most viewers are likely to notice the little yellow ad icon and just ignore it. Once again, your best bet is to stand out and catch their attention. Since they’re not obligated to watch any of your ad, you have to make them want to. All your viewers have to go off of is a title and a thumbnail, so it’s important that you put some serious thought into both. Your thumbnail should be eye-catching. Use it to convey the tone and purpose of your ad. If there aren’t any standout moments in your ad that would make good thumbnails, feel free to design one. Thumbnails don’t always have to be screencaps from your ad. Offer a message or pose a question. In the land of YouTube, attention spans are short and viewers are quick to judge. Ads are typically deemed as an annoyance and avoided whenever possible. But using the above tips and tricks when creating your ad, you’re more likely to stand out among the crowd and gain more clicks and views.